Roger Federer beats long-time rival Tomas Berdych to set up an Australian Open semifinal clash with an unheralded South Korean Chung Hyeon. 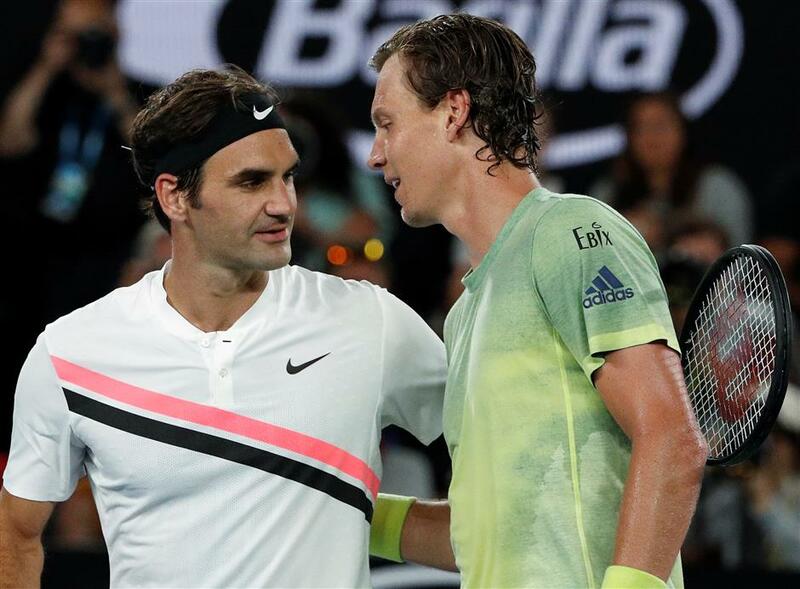 Tomas Berdych (right) of the Czech Republic congratulates Roger Federer of Switzerland after their Australian Open quarterfinal match on Wednesday. Defending champion Roger Federer welcomed the emergence of new challengers after several unseeded players made the Australian Open semifinals for the first time in nearly 20 years. The Swiss 19-time grand slam champion will face 21-year-old South Korean Chung Hyeon in one semifinal, while 23-year-old Briton Kyle Edmund will take on former US Open champion Marin Cilic in the other. The last time so many unfamiliar faces reached the last four in Melbourne was in 1999 when Tommy Haas, Thomas Enqvist and Niclas Lapenti made the semis. “I think it’s a good thing. They got to make a move. I find it disappointing when their breakthroughs come at 27, because then we know them for seven years, let’s say,” 36-year-old Federer said after beating Tomas Berdych 7-6 (1), 6-3, 6-4 on Wednesday. Federer expects the men’s game to become more unpredictable with a change back to 16 seeds, rather than 32, in slams. “We like our rivalries that do exist on the tour. New names are good, from time to time, of course for the tour. I think next year when we’ll have 16 seeds, it’s going to be quite different,” said Federer, who has reached his 43rd grand slam semifinal and is favorite to win a 20th major. Chung defeated six-time Australian Open champion Novak Djokovic in the last 16 and followed up by beating Tennys Sandgren 6-4, 7-6 (5), 6-3 on Wednesdayy. Chung became the first Korean to make a grand slam tennis semifinal. “In last game, I think at 40-love ... if I win one more point, I make history in Korea. I have to think about the ceremony, something,” he said, explaining how he got slightly ahead of himself. Then he fully embraced the moment, joking in an on-court TV interview, introducing the audience to his parents and his coach, and taking the microphone to speak in Korean to millions of new tennis fans back home. “I think all the people is watching Australian Open now because we make history in Korea,” he said. The No. 58-ranked Chung is the lowest-ranked man to reach the semifinals since Marat Safin in 2004. He’s also the youngest to reach the last four at a major since Marin Cilic did it here in 2010. Two women who’ve been to this stage at a grand slam before will meet in the last four. Top-ranked Simona Halep recovered from an early break to win nine straight games in a 6-3, 6-2 win over No. 6 Karolina Pliskova and set up a semifinal match against 2016 champion Angelique Kerber, who routed US Open finalist Madison Keys 6-1, 6-2.